I can honestly say from the moment I took my first baking class in culinary school, I had a fear of flour. Don’t get me wrong, I am completely comfortable with a teaspoon or tablespoon of flour; however, when a recipe calls for 1 cup of flour or more, I immediately yell, HELP PLEASE! It's not that I cannot cook with flour, I truly think once you bring out a measuring cup full of flour, you stop cooking and start to bake. Cook, grill - yes - it’s my passion, thus I became the Executive Chef of this fantastic grill company…baking, no thank you. I always thought it was because I was not a fan of sweet treats, now I know it has nothing to do with sweets and everything to do with the “science” behind baking. Making pizza dough is a science that requires a great deal of exact measuring and temperatures. It’s not really baking but it definitely requires the scientific qualities of baking. Lucky for me, I have a wonderful friend who is an amazing Chef and she loves to bake. 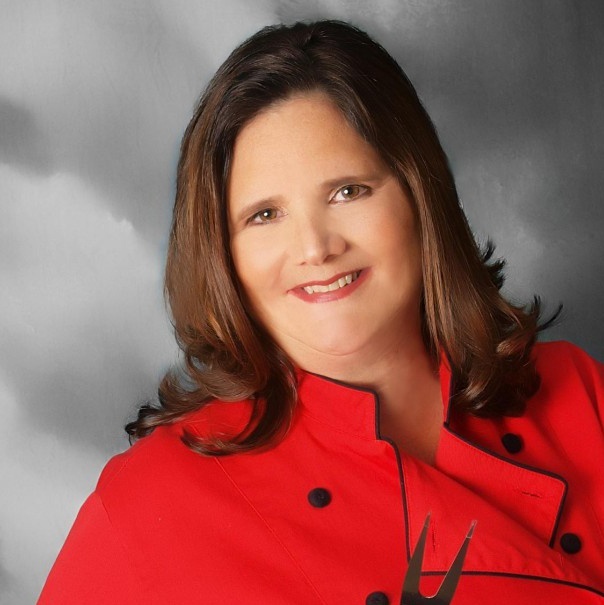 Let me introduce you to my first guest Chef on my blog, Patty Ruiz-Morrell. When I decided to develop a simple and savory grilled pizza recipes, Chef Patty came to my rescue. 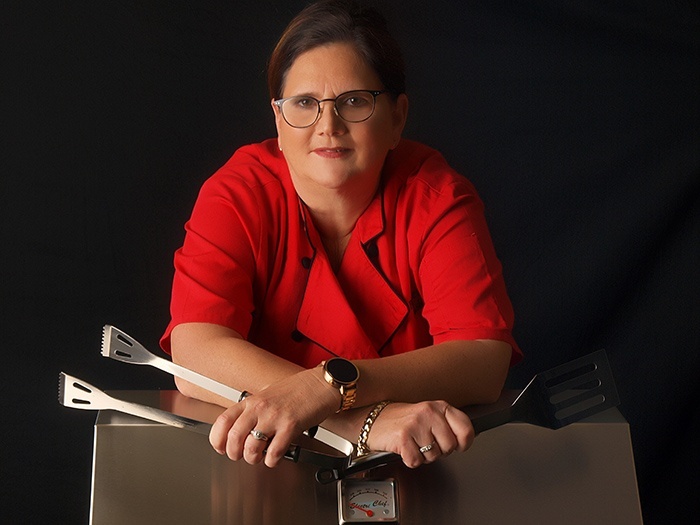 She has been teaching cooking techniques for over 25 years, not only as a High School teacher and home cook for her children and grandchildren, but for the past few years, she is the Chef/Owner of The Mad Table. Her company includes cooking classes, private catered meals and weekly recipe posts on social media. I was so pleased when I called for help, Chef Patty, without hesitation came to my house and spent the afternoon with me making her famous pizza dough (the history of pizza and flavored pizza dough recipes will be coming soon). It takes a little while to make this homemade dough, but the results are rewarding. I always love cooking with fellow chefs because you can learn so much from each other. There is so many time-saving tricks and exciting ways to build flavors. 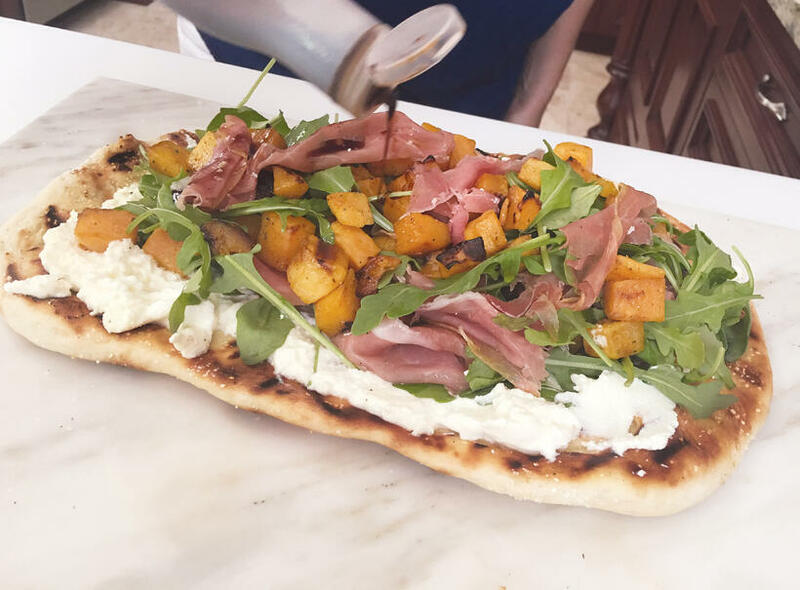 We decided to welcome Fall and make a savory Grilled Butternut Squash, Arugula, Prosciutto and Ricotta Pizza with Balsamic Glaze. Then to keep with a traditional simple but delicious pizza, we decided to create a Margherita Pizza made with Pesto or tomato sauce, fresh mozzarella, grilled blistered tomatoes, fresh basil, and of course, the best pizza dough you've ever tasted! Will it be like the time of year and Fall? While Chef Patty turned my kitchen into her science lab, I preheated my ElectriChef Grill. Most people think the soft pizza dough will fall through the grill grates, this does not happen if you properly preheat your grill. The ElectriChef Grill allows you to grill pizza very close to the technique used in a pizza oven because of the ability to set an exact temperature while still developing the smokey flavor as if you were using a wood-burning oven. I was able to grill the tomatoes for the Margherita Pizza and then the butternut squash for the savory pizza while the grill was preheating. This was the first time I ever grilled homemade pizza dough on my ElectriChef Grill. 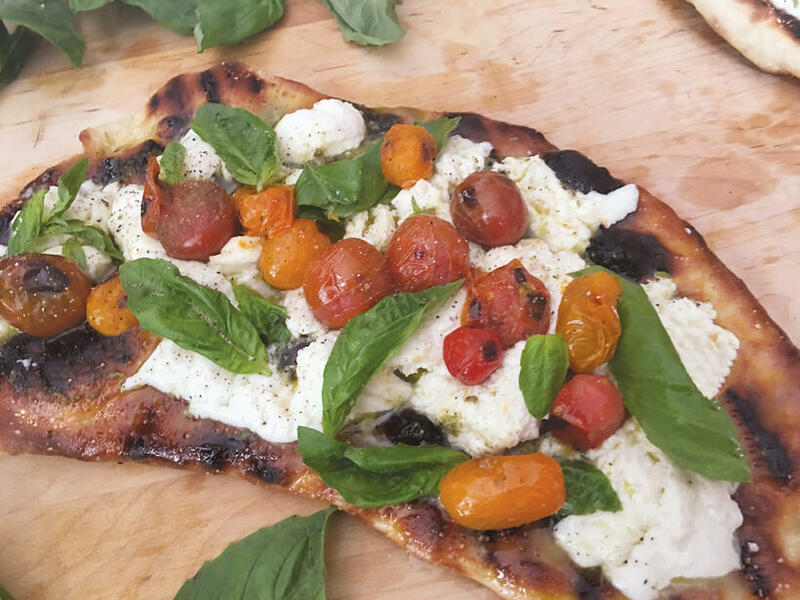 I have used store-bought dough from the local bakery and it works very well; but, if you have a nice day to cook on your grill this fall, keep the heat out of the kitchen and use Chef Patty’s pizza dough recipe below and you will love the results. Crispy, crunchy and delicious pizza right on your own patio! Repeat the recipe and make extra dough you can store in the freezer for another pizza day. Since 1987, October has been officially designated National Pizza Month in the United States. Without question, Chef Patty’s best pizza dough recipe will help you celebrate in style! Thanks Patty for a delicious and fun day!! In a large bowl, dissolve yeast and sugar in warm water. Gently stir and let sit for 7-10 minutes or until the yeast is foamy. 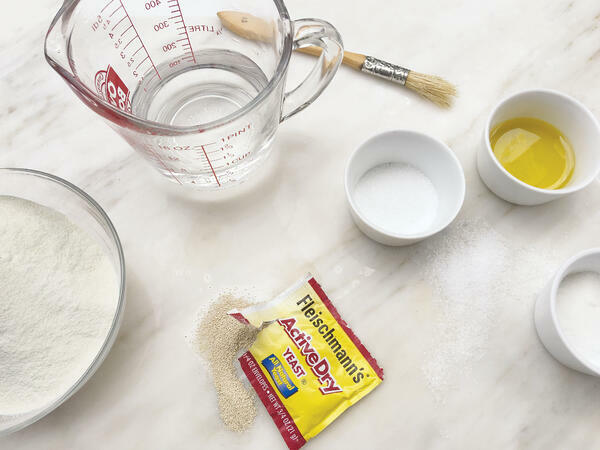 Add flour, olive oil and salt to the bowl of an electric mixer or a large bowl. Mix with the dough hook (or by hand) on low speed for 15 seconds. Add yeast mixture to bowl and mix on low-medium speed (or knead by hand) for 5-7 minutes. If your dough is too wet, add up to 1/4 cup more flour. After kneading, your dough should be smooth and elastic. Poke with your finger - if it slowly bounces back, your dough is ready to rise. If not, keep kneading. Shape the dough into a ball and place in a large mixing bowl that has been coated lightly with olive oil. Turn it over to coat all sides. Cover tightly with plastic wrap and allow to rise in a warm environment (about 9O degrees F). Depending on your type of yeast, your dough will have doubled in size in about 1 - 2 hours. Punch the dough down to release the air. Divide the dough into two. Roll each half into a ball and let rest in two separate bowls lightly covered for 15 minutes. Turn dough out onto a lightly floured cutting board and pat or roll into a round or oval shape. Dust pizza dough with cornmeal. 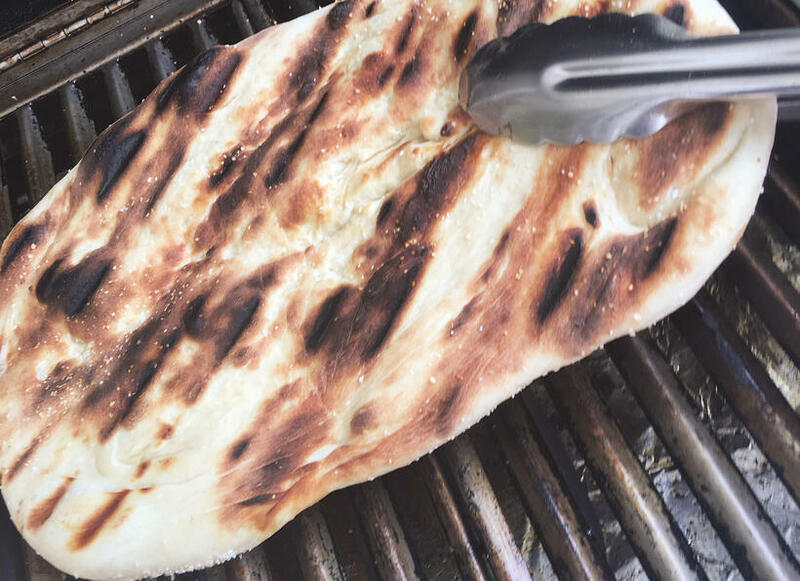 Take dough, olive oil, basting brush, kosher salt and black pepper to grill. Respray ElectriChef Grill grates with Canola oil then gently place pizza dough on grill grates. Close grill lid for 7-8 minutes, depending on thickness of pizza dough. NOTE: Depending on size of ElectriChef grill you can grill one or both pizza doughs at a time. Once the first side of the pizza dough has lightly charred grill marks, turn pizza dough with tongs. Brush grilled side with olive oil and sprinkle with salt and pepper. Once pizza dough is grilled on one side, split ingredients in half to make two pizzas. Carefully spread pesto or tomato sauce (see grilled tomato sauce recipe) on top of pizza dough. Spread mozzarella chunks evenly on top of pesto or sauce. Close ElectriChef grill lid 5-6 minutes or until bottom of dough is grilled and cheese is melted. Carefully remove pizza from grill with large spatula and drizzle with olive oil and sprinkle with fresh basil. Once pizza dough is grilled on one side, split ingredients in half to make two pizzas. Carefully spread ricotta cheese on top of pizza dough. Spread prosciutto evenly on ricotta. Close ElectriChef grill lid 5-6 minutes or until bottom of dough is grilled and ricotta is slightly melted. Carefully remove pizza from grill with large spatula and drizzle with olive oil. 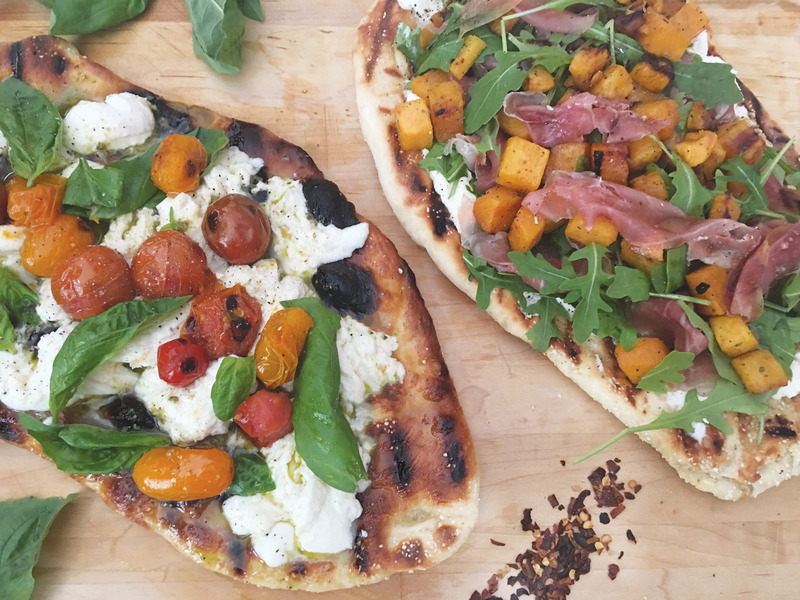 Add grilled butternut squash and arugula to pizza and drizzle with balsamic glaze. NOTE: Please use caution when basting grilled pizza dough with olive oil, dripping oil on coils can cause flare-ups and over char the dough. Turn on the ElectriChef electric grill to 500°F. Spray the grill grates with canola nonstick spray and pour 1 cup water in drip pan of grill. Place tomatoes, onions, and garlic on grill to steam during pre-heating and close the lid. Once grill is at desired temperature baste vegetables with olive oil and close lid for 8-10 minutes, turn all vegetables once. Tomatoes will begin to split and garlic and onions will start to char, remove everything from grill and place in a blender with basil leaves. Puree to desired viscosity. PRO TIP: The less you blend the chunkier the sauce will be. You can also place all vegetables in a bowl and use an immersion blender. Once pureed taste and season with salt and pepper. NOTE: You can use the sauce right away or place in a freezer safe container and use another day. Pizza toppings are a personal choice, there are endless possibilities when creating flavorful pizza. Enjoy! What’s Next? Looking for some other savory Fall recipes? Try out these grilled apple recipes! It includes a savory dinner and a mouth-watering dessert recipe (cozy fireplace not included)!